Wondering how many tons of asphalt were used in the Edgewater Drive Phase 2 Improvements Project? This recap of all things Edgewater includes an informative ByThe Numbers section and a link to CC-TV's "New and Improved Edgewater Drive" YouTube video. VISIT THE GOOD NEWS GALLERY FOR THE FIRST LOOK! WANT TO LEARN MORE ABOUT ROUNDABOUTS? Edgewater Drive opened to traffic Friday, May 19. This project widened two miles of Edgewater Drive, between Harbor Boulevard and Midway Boulevard, to a four-lane arterial roadway, designed to better serve the central portion of the County and accommodate anticipated traffic growth in the corridor. The project replaced three bridges (West Spring Lake Waterway, East Spring Lake Waterway and Sunrise Waterway) and improved five intersections, four of which will be roundabouts. Improvements also include a raised median, curb and gutter, sidewalks/bike lanes, and landscaping. Visit the Good News Gallery for progress photos, project renderings and examples of decorative elements. 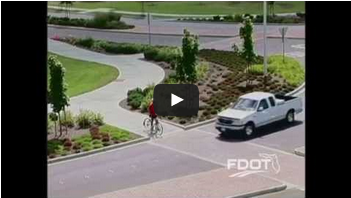 PROJECT VIDEOS: Watch CCTV's "New and Improved Edgewater Drive" video. Learn more about EP2 and watch the Summer 2015 and Spring 2016 project update videos. Edgewater Drive is open to traffic. Additional construction work remains to be completed in all areas. There will be intermittent daily lane closures while crews maintain the median landscaping, maintain curb inlets, and complete work outside the roadway. Some work will require closing portions of the pedestrian pathways to allow crews to complete work without closing travel lanes. The new traffic signal at Harbor Boulevard and Edgewater Drive is in operation. Street lights are in operation. See PROGRESS section on website for more details. Check out links to FDOT's brochure and video to learn more about navigating Edgewater Drive's new roundabouts. East Spring Lake, West Spring Lake and Sunrise Waterway bridges are open. Check the FAQ section for details on clearances, along with the Local Notice to Mariners. Charlotte County Community Services announced the closing of Spring Lake Park for renovations including the replacement/repair of all the boardwalks, replacement of the boat dock, installation of headwall in parking lot, renovation of retention pond, and repair of washout areas near boardwalks. The projected start date for the project is Feb. 13, 2017 and will continue until Aug. 1, 2017. The entire park, including the restroom along with the parking lot area will be closed for the duration of the project. Sunrise Park remains open as intermittent construction work continues in area. Motorists, please use caution and obey traffic controls. Under Florida Law, e-mail addresses are public records. If you do not want your e-mail address released in response to a public-records request, do not send electronic mail to this entity and instead, use phone or mail. Scheduled construction dates are subject to change due to unforeseen issues such as weather delays.